Names: Holodiscus means entire disc, referring to the unlobed disc lining the hypanthium (in the rose family, the hypanthium is an enlarged cup or rim that supports the sepals, petals and stamens). Discolor means two-colored; the leaves are green on the upper surface, paler beneath. 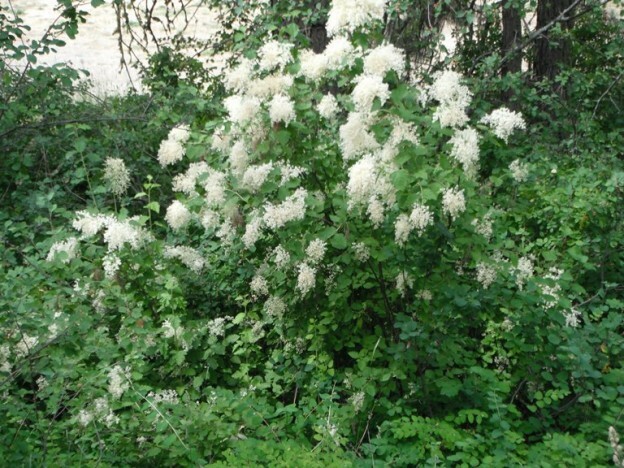 It is also known as Creambush, Creambush Rock Spirea or Ironwood. 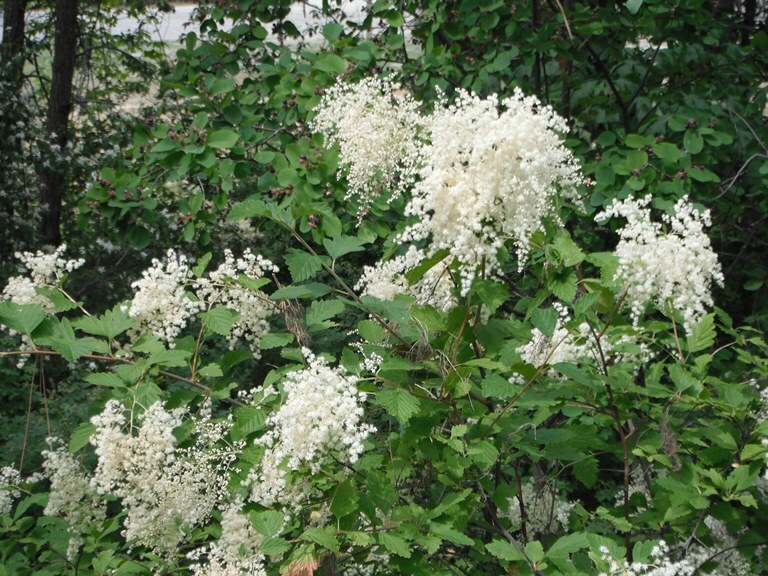 Both Oceanspray and Creambush refer to its cascading, creamy-white flower clusters. 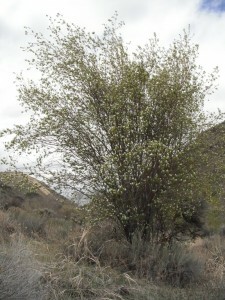 It is called Ironwood due to the strength of its wood. Relationships: There are seven to ten species of Holodiscus, all native to the Americas; from British Columbia to Bolivia. 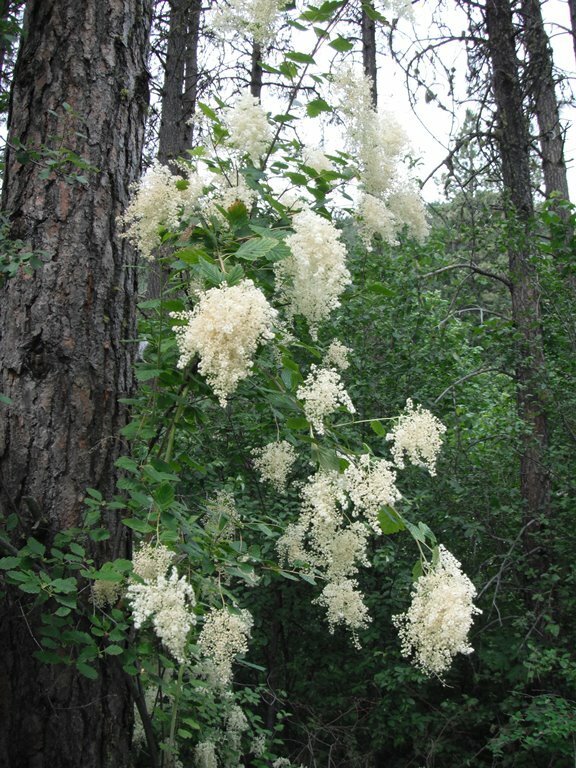 Two species are recognized by USDA in North America: Holodiscus discolor and H. dumosus, Rockspiraea, which is native from Idaho south to Arizona and western Texas. 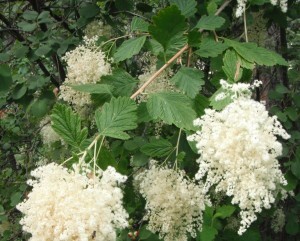 Some species, such as H. microphylla, and H. australis, recognized by other authors, are included in Holodiscus discolor. 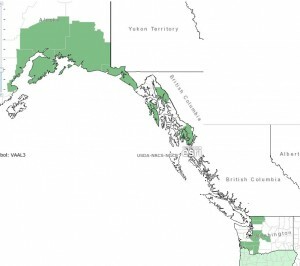 Distribution: It is native from southern British Columbia to southern California, east to western Montana, Colorado and Arizona. 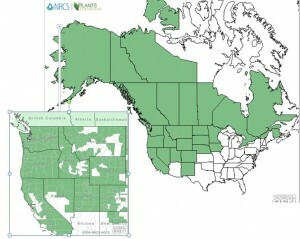 All U.S species are similar and are mostly only separated due to different leaf morphologies and distributions. Growth: Oceanspray can range from 2.5 feet (.75m) on harsh, cold and windy sites to 12-20 feet (4- 7m) in open coastal forests, but they more often grow 3-10 feet (1-3m). They rarely live more than 30 years. Oceanspray growing near the rim of Crater Lake look very different from those growing in a sheltered forest. Besides being much shorter, the leaves are smaller and thicker. 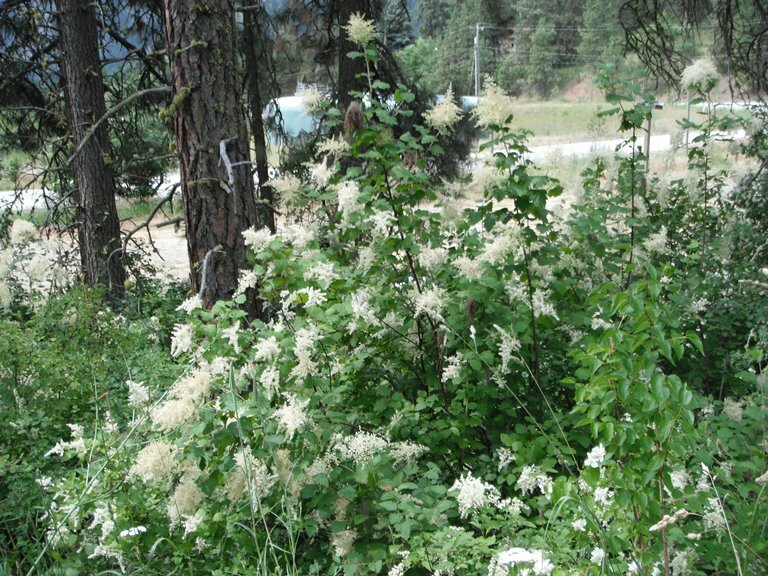 Habitat: Oceanspray grows on dry to moist, open forests or coastal bluffs and is common in open, disturbed areas, such as logged or burned areas and roadsides. Diagnostic Characters: Oceanspray can be recognized by its alternate, oval to triangular leaves with lobed or coarsely and doubly toothed margins. The green, upper surface of the leaves can be smooth or coarsely-hairy; the paler, under surface is strongly veined and soft-hairy. 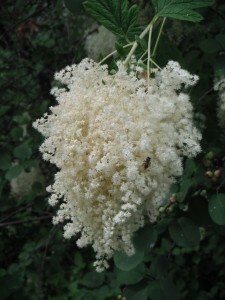 Its flowers are white to cream with lilac-like drooping clusters. Seeds are actually wooly achenes (dry, one-seeded fruit) in tiny dry capsules. It usually has several main stems with brownish peeling bark; the ends of the branches arch gracefully outward. In the Landscape: Oceanspray can add charm to a garden with its attractive, small, lobed leaves and graceful arching habit. Its creamy-white drooping flower clusters are spectacular in full bloom but are not as attractive when they turn brown later in the summer. It is drought tolerant– ideal for drier areas of a landscape. It is a good choice for a sunny woodland garden, near the back of a shrub bed, or next to a building. Phenology: Bloom time: June-July. Fruit ripens: Late summer. Propagation: Seeds require a 120 day cold stratification period at 40ºF (4ºC) but they germinate readily and abundantly after the stratification requirement is met. It is easiest just to sow the seeds in an outside bed in fall for later transplanting. Hardwood or (semi-hardwood) cuttings may have some success. Layering and division are also possible. Oceanspray will sprout from the root crown after top kill. Use by People: The wood, known as “Ironwood” in English, was used for many tools and utensils by natives. It was made even harder by heating it over a fire and polishing it with horsetail stems. It was used for roasting tongs “because it won’t burn,” for digging sticks, fishing hooks, needles, canoe paddles, bows, and spear, harpoon, and arrow shafts, Oceanspray pegs were used in construction, when nails were not readily available. Use by Wildlife: Oceanspray has little food value for wildlife. Browsers consume it only when more palatable food is scarce, but it appears to be palatable to native slugs. Oceanspray provides good cover for birds, small mammals and amphibians, such as the Pacific Treefrog. Flowers are pollinated by insects. Seeds, although most often disseminated by wind may also be dispersed by animals. 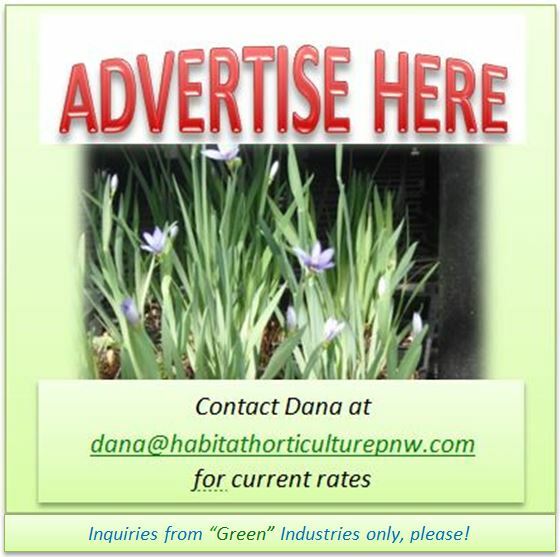 This entry was posted in Deciduous Shrubs & Vines on March 21, 2016 by habitatdana. 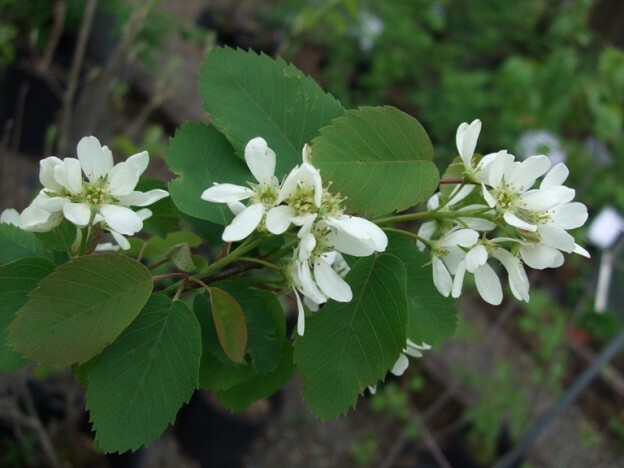 Names: Saskatoon Serviceberry is a combination of two of its most familiar common names. It is also known as Juneberry, or Western Serviceberry. Historically it was also called “pigeon berry.” In some regions, serviceberry is pronounced “sarvis”-berry. Saskatoon comes from the Cree word for Serviceberry. The city of Saskatoon, Saskatchewan was named after the berry. The name “serviceberry” apparently comes from the similarity of the fruit to the related European Sorbus. 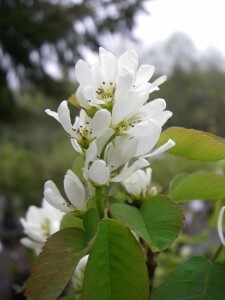 The origin of the generic name Amelanchier is derived from the French name of the European species, Amelanchier ovalis. Alnifolia means “alder-like” leaves. 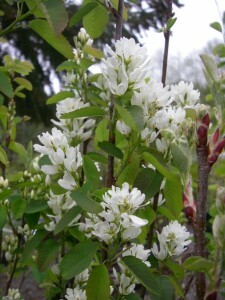 Relationships: There are about 20 species of Amelanchier, all shrubs or small trees. Most are native to North America with two in Asia and one in Europe. 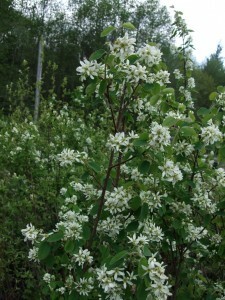 In some literature, Saskatoon Serviceberry is listed as Amelanchier florida. 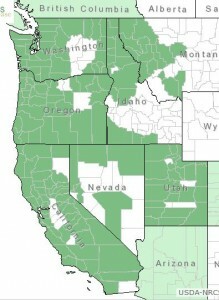 Notable varieties in the west include var. semiintegrifolia (Douglas, quoted in Hitchcock & Cronquist, writes that it is “plentiful about the Grand Rapids, and at Fort Vancouver, on the Columbia, and on the high ground of the Multnomak (sic) River. ;” var. cusickii from the east side of the Cascades has larger flowers; and var. humptulipensis was discovered on the Humptulips Prairie in Grays Harbor County, Washington. Serviceberries hybridize readily making species identification sometimes difficult. Cultivated varieties are grown for larger, sweeter berries, especially in Alberta, Saskatchewan, and Manitoba. Distribution: Saskatoon Serviceberry is found throughout most of Canada and western North America; from Alaska to California in the west; reaching eastward in Canada to Quebec; to western Colorado and northern Nebraska and Iowa in the United States. Growth: Saskatoon Serviceberry grows 3-15 ft. (1-5m) tall, sometimes taller. It is relatively short-lived; most will live about 20 years but some have survived to 85. Habitat: It grows in a variety of habitats from rocky shorelines, stream banks, and open forests to prairies and dry mountain slopes. Wetland designation: FACU, It usually occurs in non-wetlands, but occasionally is found on wetlands. 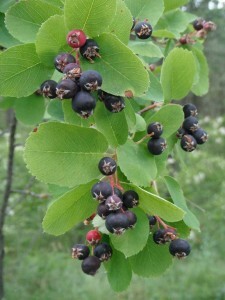 Diagnostic Characters: The thin, round leaves of Saskatoon Serviceberry are entire (not toothed) at the base and regularly toothed along the upper margin. The showy flowers are white and star-like. The ripe fruit is a small berry-like pome; dark, reddish purple to nearly black. In the Landscape: Serviceberry is an outstanding landscape plant. Not only is it attractive through every season, it has the bonus of producing edible fruit. In spring, it is loaded with bright, star-like white blossoms. In late summer, it produces clusters of purplish-black little “apples;” soon followed by the changing of the leaves to yellow or red in autumn. An attractive branching pattern adds winter interest. It grows in sun or partial shade; and is superb in an open woodland garden or on a sunny bank. Phenology: Bloom time: May-June. Fruit ripens: July-August. Propagation: Seeds require a cold stratification for 180 days at 40ºF (4ºC). “Green” seeds that are harvested before they are fully formed and the seed coat has hardened may require less time. Stored seed may benefit from a warm stratification period for 4 weeks prior to the cold stratification; otherwise seeds may take 18 months or more to germinate. Suckers that have roots may be divided from the mother plant. Layering is possible but it may take 18 months for roots to grow sufficiently. Use by People: Natives ate the fruit fresh and dried; some used it to season soup or meat. Some tribes used burning to encourage stands of Saskatoon; it will resprout from the root crown or rhizomes after the top is killed by fire and may fruit again after two years. Interior tribes used the tough wood for arrows, digging sticks, and drying racks. Coastal tribes used it for rigging their halibut lines. The Snohomish used the wood to make discs for a gambling game called slahalem. In early American folklore, the plant’s flowering time signaled pioneers that the ground had thawed enough in spring for the burial of the winter’s dead. Today people use the fruit for making pastries, jellies and syrups. 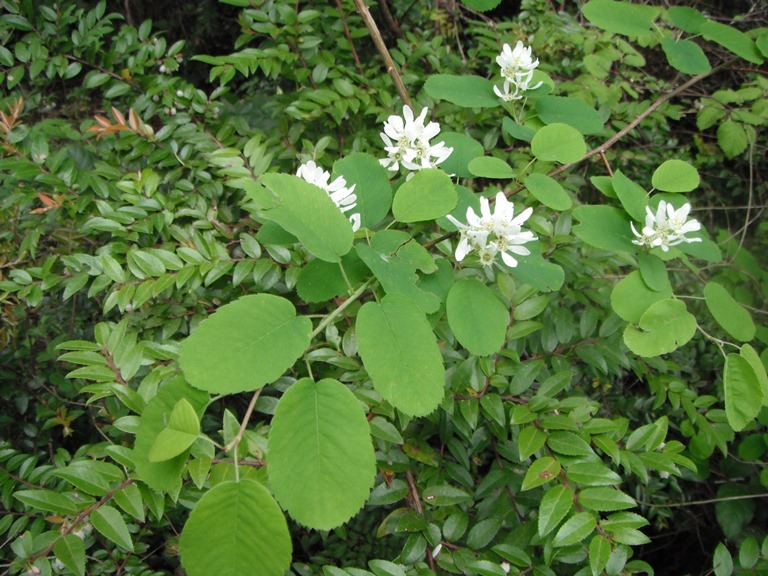 Use by Wildlife: Saskatoon serviceberry is a valuable wildlife plant. Many species of rodents and songbirds eat the fruits, including chipmunks, crows, thrushes, robins and Western Tanagers. Black Bears, beaver, marmots, and hares eat twigs, foliage, fruits and bark. Moose elk, and deer, especially Mule Deer, browse the twigs and foliage; however due to the high concentration of cyanogenic glycosides in young twigs, a diet consisting of more than 35% Saskatoon Serviceberry may be fatal. 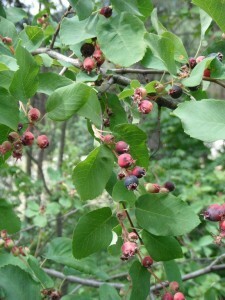 This species is often listed as a variety of Saskatoon Serviceberry (A. alnifolia var. pumila) and is very similar except for its smaller stature (pumila means dwarf) and smoother, less fuzzy flowers and leaves. It grows 3-6 feet (1-2m) tall. Its leaves are somewhat leathery. 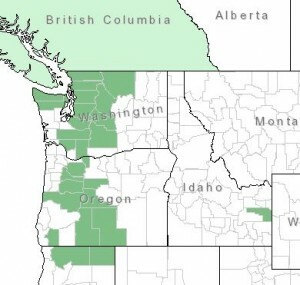 In Washington, it is more common on the eastern slopes of the Cascades; its range extending through the Sierras of California, eastward to western Montana and northwestern New Mexico. 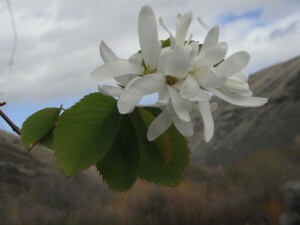 Dwarf Serviceberry is at home on drier mountain slopes and open prairies. This entry was posted in Deciduous Shrubs & Vines on March 14, 2016 by habitatdana.